William Kensell, pictured here in 1925, was a glass-blower at Crown Crystal in Australia. ​Interestingly, another name is provided in the book “Carnival Glass of Australia” which reports that a Mr. L. Vesey “was the only employee of the Crown Crystal Co. Ltd., with the ability and skill to blow the really large examples of these wares”. But clearly, as the photos here show, William Kensell was also doing the job with great enthusiasm! ​The pictures are courtesy of the National Library of Australia; they come from “Pix Magazine”, an Australian pictorial weekly that ran from 1938 to 1972, sometimes featuring industry as well as lifestyle and popular culture. 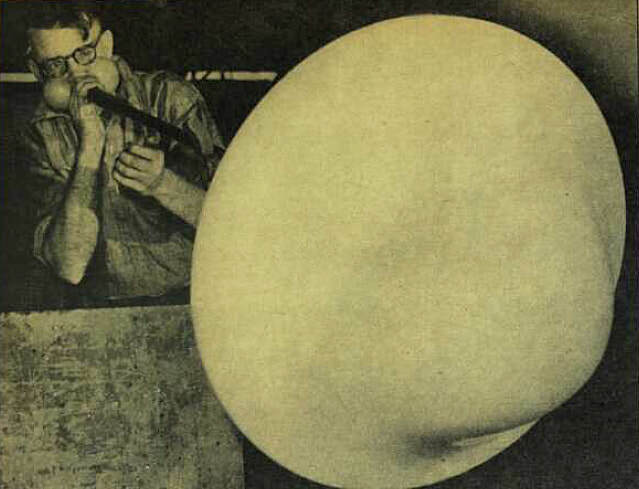 ​An issue of Pix Magazine in 1940 took an in-depth look at Crown Crystal Glassworks in Sydney. The article reported that 1400 employees worked there “supplying Australia and New Zealand with glass ranging from beer mugs to cut crystal”. 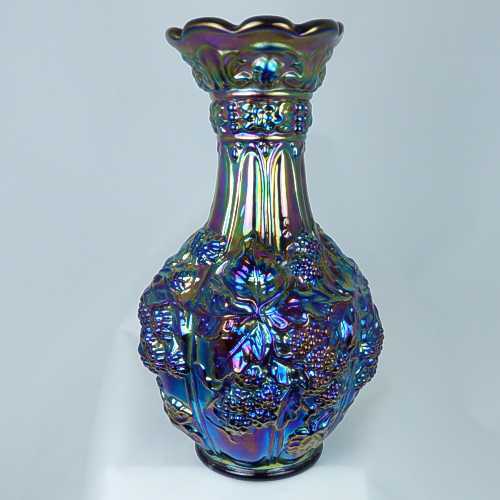 It was around this time that the Carnival Glass Melon Rib vases were made, and we know they were mould-blown. 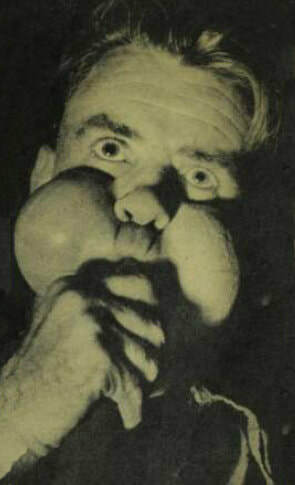 ​Our understanding is that mechanical methods of “blowing” were increasingly used, but clearly the old mouth blown method was still in practice, according to these amazing images of William Kensell. ​stand at the Sydney Show, 1938. A 1941 ad from the Hobart Mercury newspaper. ​Thanks to Gio Sabino Lopez for this splendid photo featuring four Melon Rib vases from Crown Crystal. ​Gio's vases are (left to right): smoke Carnival, rosalin pink not iridised, uranium green/Vaseline not iridised (the first reported in this colour) and marigold Carnival. The intriguing Melon Rib story is covered in full here: Read All About It - The Melon Rib Proof! The diagrams used below are courtesy of Marty Seufer and they were the work of (the late) Howard Seufer. A man of many talents, Howard was a committed educator and he made many presentations about the art and science of making Carnival and pressed glass at Fenton. There were two basic methods used for making Classic Carnival Glass - press moulding and blow moulding. ​​​The most common method, press moulding, requires the use of a plunger that is pressed down into a mould to create the basic shape of the piece (and also to form any interior pattern). The diagram on the left, (above) shows a typical press mould set up. ​However, it is readily apparent that some shapes cannot accommodate a plunger, for example, where the piece is narrower at the top of the mould and wider elsewhere (such as the Fenton Apple Tree pitcher shown on the right, courtesy Seeck Auctions). This is where blow moulding techniques are needed. Molten glass is gathered on the end of a hollow pipe (blowpipe), and air is blown down the pipe - by mouth or by mechanical means - to part-inflate the glass gather. The partly inflated "sack" is inserted into the mould and fully blown to the shape of the item. Above: two examples of blow moulded Classic Carnival. On the left is a white Fenton Apple Tree pitcher (courtesy Seeck Auctions) and on its right is a purple Imperial Loganberry vase. This fascinating tale begins in England, progresses through Europe and ends at Fenton Art Glass in the USA! Like all good stories there are twists and turns along the way, but unlike regular mysteries, let's start at the end and work back from there. On the right is a Tulip Vase in Contemporary Carnival Glass. It is 8½” tall and was made by Fenton in 2004, as part of a special "revival" range of amethyst Carnival Glass, more about which later. When we saw it, it immediately reminded us of an opalescent Barolac vase (not Carnival) made by Josef Inwald in the 1930s. So what’s the story? Did Fenton use the original Barolac mould or perhaps they made a new mould that was inspired by it? ​In fact the story is much more interesting – and much more complex than that. And so we look to the start of the story ... in England and Czechoslovakia. Some years ago our research led us to Tim Jenkins: he is the son of Douglas Jenkins, and the grandson of John Jenkins. Tim very kindly gave us a wealth of material about John Jenkins & Sons Ltd., an English firm of glass designers and importers (founded in 1901 and still in business). In the early 1930s, the firm was sourcing a new range of glass in the style of the fashionable (and expensive) Lalique glass. Tim recalled Douglas telling him how the firm commissioned a glass factory in Czechoslovakia to make moulds for, and produce a range of glassware called "Barolac" - that factory was Josef Inwald’s Rudolfova Hut works. ​As you can see, one of the moulds listed in the letter was for "Vase Nr. 11282", which is what is known as the Barolac Tulips Vase. ​Exquisitely beautiful “blue-print” sketches accompanied the letter – we feel it is very possible that these were drawn up by Rudolf Schroter, Inwald's master designer. 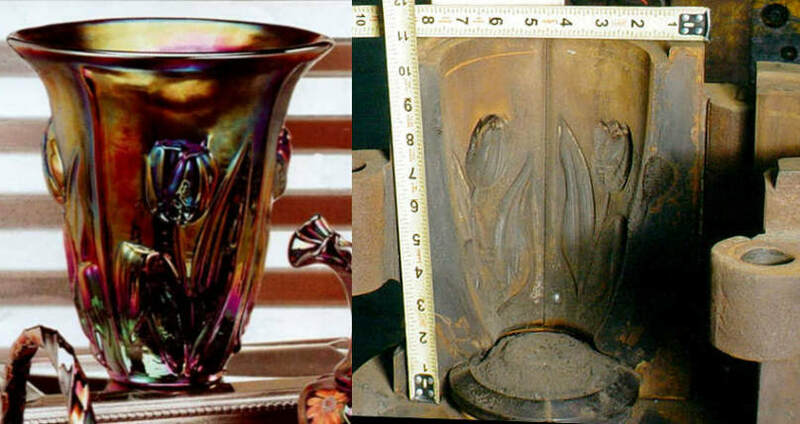 - and the original blue-prints for Barolac's Tulips Vase is shown above on the right - the art work is truly stunning. At this point we temporarily pause our journey to show this catalogue illustration on the immediate right. It is the actual Jenkins / Inwald's Tulips Vase of the 1930s. Note the height of the vase: 9½ inches. The original moulds for this and other Barolac items were later used / copied by several glass companies in the Czech Republic. They were also marketed in the USA and beyond by the wholesaler Weil, and some have even re-entered the glass market with fake "Lalique" marks on them. Above: Contemporary Fenton Tulip Vase, courtesy of Seeck Auctions. Above: blue-print for Barolac Tulips Vase, 1934. ​How does our journey get to Fenton? 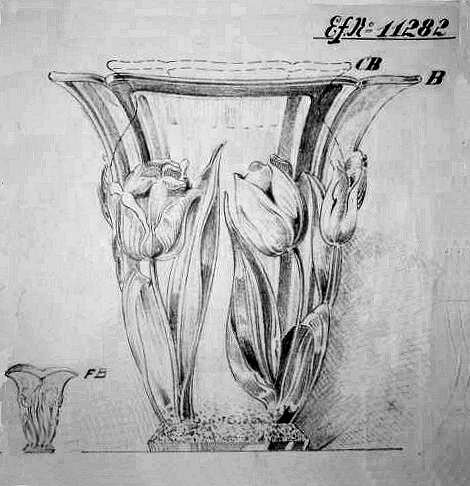 There is a clue in the text of the Fenton catalogue which showed the Contemporary Tulip Vase - it describes some of the catalogue items as being made from "unique moulds (some from Fostoria and others from Imperial or Indiana)”. The reference to "Indiana" potentially leads us along a misleading path. Fenton's Tulip Vase made in 2004 and on the right, the actual mould, originally from McKee. Although the Tulip Vase mould arrived at Fenton in 2003 when they purchased a number of moulds from Indiana Glass … it is almost certain that Indiana had themselves purchased the mould much earlier - from McKee. Fenton used the McKee (then later, Indiana) mould for the next stage of our journey when they decided to use the Tulip Vase as part of a range to celebrate the revival of their popular amethyst Carnival. Fenton called it the 2856 C4, Vase, Tulip, 8½" (above, centre) and indeed courtesy of the Fenton Family and Fenton Art Glass Company, we can show you a picture of the actual mould that was used at Fenton (above, right). ​Fenton used the McKee (then later, Indiana) mould for the next stage of our journey when they decided to use the Tulip Vase as part of a range to celebrate the revival of their popular amethyst Carnival. Fenton called it the 2856 C4, Vase, Tulip, 8½" (above, centre) and indeed courtesy of the Fenton Family and Fenton Art Glass Company, we can show you a picture of the actual mould that was used at Fenton (above, right). ​​Overall, it was quite a journey! It also perfectly illustrates the connections and the inspiration of designs between glass factories, especially between Europe and America, and vice-versa. Finding the Contemporary Tulip Vase in Fenton's 2004 catalogue caused us quite a surprise - but it also gave us much more food for thought, worthy of an article all of its own! 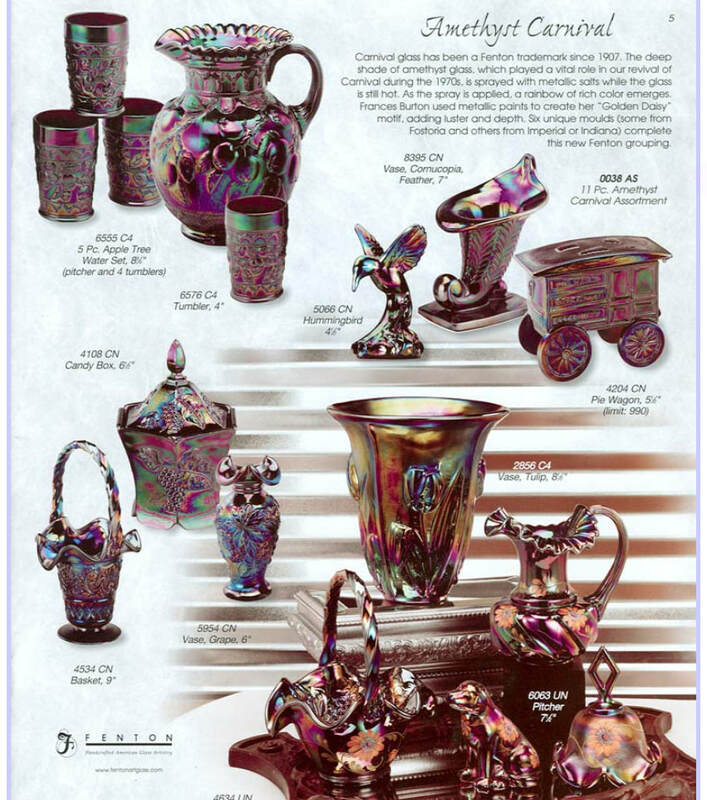 Here on the right is a low resolution image of the "Amethyst Carnival" page in the 2004 catalogue. The image is shown courtesy of the Fenton Family and Fenton Art Glass Company. Click on the image to see it full size on our website. This Fenton catalogue page gives collectors a fascinating insight into Fenton's Contemporary Carnival production at that time, and we explore this in considerable detail in our articles on Contemporary Carnival Glass made by Fenton. Courtesy of the Fenton Family and Fenton Art Glass Company, we can show you not only the catalogue, but also wonderful images of some of the moulds that Fenton acquired from other glassmakers, and subsequently used to make these pieces. ​​Propeller by Esberard – courtesy Claudio Deveikis. Carnival Glass researcher, Claudio Deveikis, who specialises in glass from Brazil, showed us this fascinating bowl that he has called Propeller. Claudio named it Propeller as the “division of the pattern into three parts” reminded him of a propeller. The bowl has the "ESBERARD RIO" moulded mark, confirming the maker to be Esberard of Rio de Janeiro, Brazil. We were intrigued by the similarity of the pattern to Moulé Médaillons, Bayel – which was discovered by John Hodgson in the 1927 Bayel, Clairey and Fains catalogue (France). The fundamental difference between the two patterns is in the base, and the way in which the exterior pattern is divided into three – but the main pattern around the sides of the bowl is almost identical. The ESBERARD mark on Claudio's Propeller bowl. Propeller, made by Esberard, Rio. Thanks to Claudio and John for showing these beautiful and fascinating pieces of glass. We have talked several times about (the late) Bob Smith – a dedicated and principled collector and researcher who built up a unique and comprehensive collection of Carnival Glass tumblers, old and new. Selflessly, with no thoughts of personal gain, he told us and others, of his over-riding wish: that after his death (which came way too soon), his collection was to be kept altogether and intact as a “reference collection”, to be used for the education of all glass collectors and researchers around the world. He gave his collection to Glen with a specific, clear and unmistakable wish: it was to be Bob’s legacy for the future education of the entire Carnival and glass community. We could never give our consent for the collection to be broken up or sold. We are now reaching out to the glass community in the USA - to museums, Carnival Glass clubs and other organisations to explore how to honour Bob’s heartfelt and expressed intentions. We appeal to anyone who has influence or connections to let us have your thoughts: can we – as a Carnival Glass community - collectively respect Bob’s memory, and protect his legacy collection for the future education of all? Please email us at the address shown at the bottom of the page. Can you believe that almost 800 Carnival Glass patterns and over 50 different makers are identified in our Carnival Glass from Europe! That is a truly amazing output. And it was produced not only for the local market, but also for export around the world. Now, with the massive use of online sales and auctions, European Carnival can - and has - turned up almost anywhere. So, if you are interested in Classic Carnival, this is essential reading for you. It is in an easy-to-read PDF format, clearly set out with a wealth of images and catalogue illustrations. It is available without delay by a downloadable file. If you prefer, we can send it by post on a CD, USB/flash drive, or a Micro/full size SD card. To find out more and to order your e-book go here: Carnival Glass from Europe​ (or click on the image on the right).